Whereas as a rule British footballers seem to shy away from playing overseas - indeed many prefer going to the lower leagues and even into semi-professional football rather than going abroad - a completely different mentality seems to govern coaches. Indeed it is the opposite where many actively look for what opportunities there might be in other countries. There are many reasons for this. Undeniably, one relates to the lack of (paying) opportunities that there exist in England where many coaches are expected to work either for free or else on a part-time basis. However it isn't just that. Increasingly coaches are feeling the need to experience different cultures and mentalities to help them grow. Ally Bain is one such coach. Having started out coaching in community schemes, he chose to pursue a role in America that provides him with a greater scope to grow. Indeed, it has helped shape his philosophy in a way that would have been impossible if he had stayed back home. Blueprint for Football: How did you take up in coaching? Ally Bain: I started coaching purely by chance. I stumbled upon a level 1 coaching course through the Scottish FA when I was 15, as part of a PE class that I was taking at high school. Part of the course was to develop teaching methods in real life environments, so to supplement the content we were placed in local primary schools to gain on field experience. From this I started an Under 11 football team at my old primary school, which strangely enough I had been playing in 4 years earlier! BfF: What, do you feel, is the most important skill for a coach to have? AB: I feel the most important skill to have is an ability to connect with your players and communicate information effectively. Our role is to facilitate information to those we are leading, which somewhat renders the knowledge we have accrued meaningless if we are unable to pass it on with accuracy. In coaching schools there is a heavy emphasis on “tactical understanding” and “skill development games”. However often these miss the point unless we are able to explain why these factors relate to a specific group of individuals. BfF: Have you had any mentors who have helped develop your way of thinking and of coaching? AB: My first mentor in the game is current Annan FC manager Jim Chapman. Jim actually co-ordinated the level 1 course that got me started in coaching, back when I was 15. During that time I was thirsty to learn and even more eager to see him operate 1st hand. What struck me was his ability to use words to assist players understanding of the mechanics of their role. He could speak through a scenario and it would allow the player to be completely clear on what he was asking of them. I was of course extremely impressed by this, and to this day strive to emulate what I saw in those 1st few years in the game. Lately I have started working with a professional in the psychology world named Jeff Irving. He does not have a back ground in football, however he has completely transformed my ability to handle my own emotions and thought process before articulating key information to the players. BfF: Talking about thinking, what is your philosophy? AB: Many view philosophy as a rigid, concrete or solidified concept. I tend to challenge this view point and see philosophy as a more transient commodity, one that must adapt to its surroundings and live inherently in the present. For example, part of my role within GPS Portland Phoenix is to manage our youth academy. Our philosophy within that department is based heavily upon skill development, which will allow players to move fluently across the field. Ultimately this department is in it for the long haul, so we have more time to exercise this philosophy. Our men's team which operates in the USL PDL, the Non League equivalent of US Soccer, is a different beast all together as our philosophy predicates maximizing our preparation for the next match. Our playing style is much more protective and counter attacking based, mainly because we have 90 minutes each week to validate our team development. BfF: How did you develop it? AB: I developed my understanding of this transient philosophy when studying how youth academies are viewed within the time continuum of a professional football club. Ultimately academies are facilitators of development, therefore the coaches who operate within that world must use thought processes that stretch over a decade. I currently coach our Under13 boys in addition to the men's team, and I would argue that this group are far more tactically developed than our men's team - comparatively speaking - simply because I have had longer to work with them. While our men's team are still a strong group collectively, this unity has been brought about through applying principles and initiating guide lines that we must all adhere to. If we therefore evaluate the two, as is the case in almost every club out there, our academy Philosophy is completely removed from that of the 1st team. BfF: Do you find yourself adding to it along the way? And if so, how does that process typically occur? AB: My outlook on philosophy will undoubtedly continue to develop and progress as my career continues. I personally gain more from listening and watching others, than actually doing it on my own. In the last twelve months my club has formed a partnership with FC Bayern Munich, and as part of the exchange we have had access to their head academy staff. Sitting back and listening to them speak about their methods and approaches toward certain aspects of their program has been absolutely spectacular. Often in football we are so caught up in what we are doing, we forget there is a world out there doing what we are. I would encourage any coach to use those clubs around them as a learning tool, it has definitely altered my mindset toward philosophy and development. BfF: How do you communicate? Both your thoughts for a particular session and, in general, for getting across your philosophy which typically takes longer to put across. AB: With our youth players a lot of my communication is guided discovery. I want to ask them as many questions as I can, which will therefore bring about a new level of understanding, that allows them to become self sufficient in times of need. By employing such a transient and fluid plying style amongst our players, they need to be able to problem solve effectively and brain power certainly plays into that. With our men’s team I utilize video as my main component of transferring information. This key visual aid provides the players with a clear understanding of what I want from a certain situation, but also affords them a learning opportunity to see what went wrong first hand. BfF: You've worked with Watford and Crystal Palace in the past. What roles were those? AB: My route into football came like many through the grass roots football in the community programs. I worked as a football development officer at both of these clubs, and was charged with developing specific programs within a designated geographical area. Many of the children I worked with during this time were mere beginners, those who were trying the game for the 1st time - 3 and 4 year olds - and those who simply used football as an after school activity, a vehicle if you like to socialize with their friends. Another element of both programs was the development centre concept. Both Watford and Crystal Palace are clubs based in extremely densely populated areas, so with only one academy team per age group, there was a requirement for a conduit program that would prepare players for the next level. We formed a development centre concept that allowed higher level players from local boys clubs to train once per week together and often take part in friendly games against the academy team of their age group. While this is a fairly common practice in 2015, at the time it was still fairly novel idea and increased the clubs ability to reach more high level players. BfF: What exactly is your current role and what led you to taking it up? AB: My official title within GPS Portland Phoenix is General Manager. I wear many hats at the club, which sees my coverage spread across both football and business aspects of our operation. Prior to joining the club I had spent time previously in the US, working for a small operation in New Jersey. In 2009 I was made aware that a new club was forming in Maine, so I contacted the owners and interviewed with them in London. At the time the club didn’t exist, so we were purely conceptualizing what we would like the program to become and what we could envisage. I was fortunate enough that the owner felt I was the person to lead the charge…fast forward six years and we’re still going strong. BfF: Did you have worries that going outside the UK coaching system might hinder your career? AB: Not in the slightest. In the UK there is a gulf between those who operate at the professional level and those who are starting out in the game; therefore I actually felt leaving the UK would enhance my learning experience and prepare me for a longer career in the game. BfF: As a coach, what is the biggest change that you've had to face since going to America? And how did you handle it? AB: As coaches our ability to communicate is key, therefore we require terminology that is inextricably understood by our players. Coming to the US presented me with a huge problem initially, as almost all of my learned terminology was useless. As with any part of the world, the people here have formed their own “Football Dictionary” so to speak, but there is some natural cross over. Ultimately I had to approach things with an open mind and reach a common ground with participants that allowed us both to be fully aware of what each other wanted. BfF: Do you think it is important for coaches to experience different countries and places to work? AB: I think it has definitely benefitted both my career and development as a coach; however it is not for everyone. Some individuals struggle to adjust socially to new surroundings, which in turn takes the focus off developing their skill sets. BfF: How do you find that the kids you coach look at you since you're a foreigner? AB: Initially it can be awkward for players, especially as they need to listen hard to process my west central Scotland accent! But once the novelty wears off they simply connect me as “the soccer guy” and from there on in it’s up to me to make it a positive experience. One aspect my younger players still struggle to grasp is the amount of games per weekend I watch on TV. The American youth culture isn’t really geared toward watching sports, as much as it is playing them, so It’s still a hard concept for them to grasp that I find time to watch over 10 games a weekend on TV! BfF: What are the biggest difference between English players and American ones (if there is a difference)? AB: Ultimately there truly isn’t a difference between English and American players. Youth football in the US operates a very similar calendar, so the two countries afford players the opportunity to play competitively all year round. If there was to be a differentiation it would have to be the structure afforded to adult players in the US. With 94 professional clubs spread across 55 million in England and only 42 professional clubs spread across 318 million in the USA, you can quickly establish that the progression afforded to US players begins to diminish their ability to fulfil their potential. This begins to manifest itself into deficiencies that in the adult game become clearer to the eye; stunt in game awareness, tactical nous and the technical skills to open up a game. BfF: And, finally, what do you want to achieve to be satisfied with your career as a coach? AB: What I will continue to strive for is an ability to help players develop their game. If this remains in the youth development world or indeed I am afforded an opportunity to operate at the professional level, my goal will be to continue serving those I work with. Players are the very core of the game, so to be privileged enough to form a small piece in the cog that helps the game turn, I will continue to work hard to improve and hopefully that rubs off on others around me. 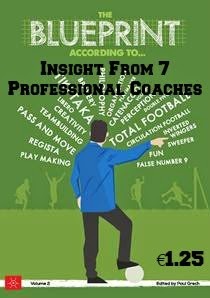 Blueprint According To...Volume III will be published soon and will contain the finest of our recent interviews with football coaches. 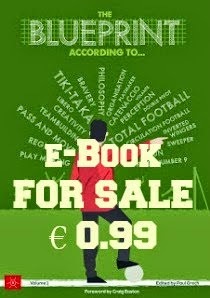 Subscribers to Blueprint for Football Extra will not only be the first to get their hands on this e-book, they will do so for free. So join, here.